Released today is the eighth film in the Planet of the Apes franchise, “Dawn of the Planet of the Apes.” Set ten years after its predecessor “Rise of the Planet of the Apes,” this film promises a darker, more engaging science-fiction world than any other Apes film before it. 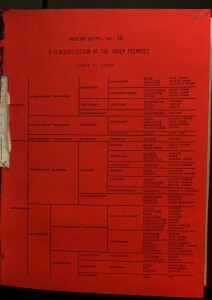 In honor of the new movie, Special Collections is proud to bring you “Books of the Planet of the Apes”! If you’ve got a monkey on your back, swing in to Special Collections and check out some of our simian stuff! 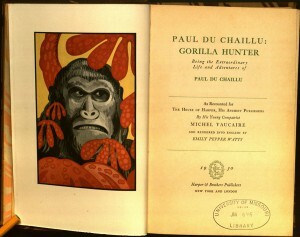 This is a scan from one of the opening pages of “Paul Du Chaillu: Gorilla Hunter,” the noted French-American explorer and zoologist. Du Chaillu is credited with confirming the existence of gorillas, and worked extensively with indigenous Pygmy tribes in Africa. 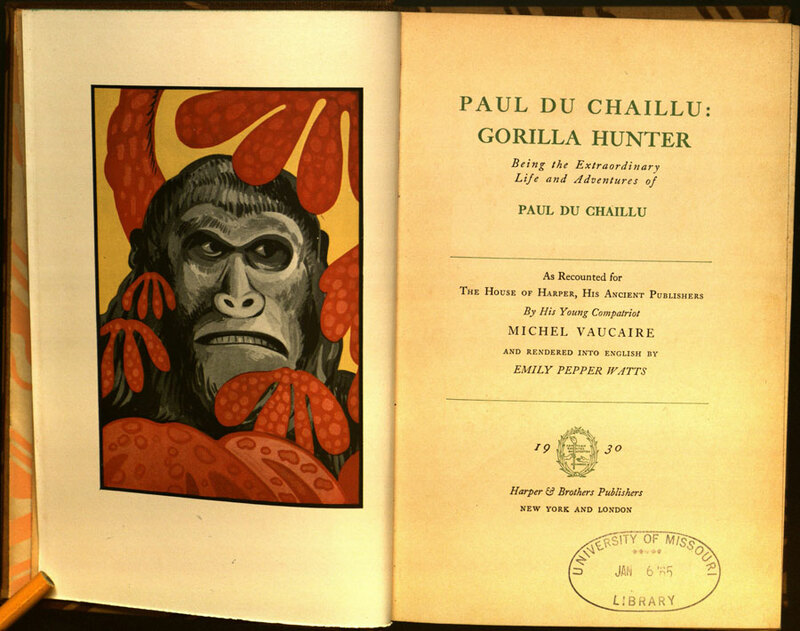 His exciting life of adventure and discovery is chronicled in “Gorilla Hunter,” and while some today might find the subject matter offensive, Du Chaillu’s legacy in ape history is unquestionable. 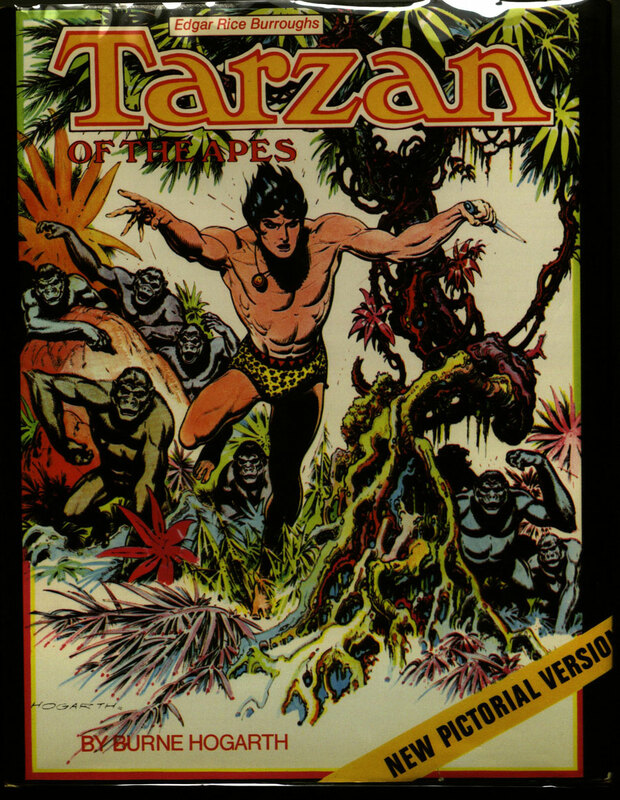 Up next we have a graphic novel adaptation of one of the most famous apperances of apes in popular culture, Tarzan the Ape Man. Tarzan was created by Edgar Rice Burroughs and introduced in the 1912 short story, “Tarzan of the Apes.” In Burroughs’ origin story, a family is marooned on the African coast and only their young son survives. He’s adopted by a tribe of apes and raised as their own. 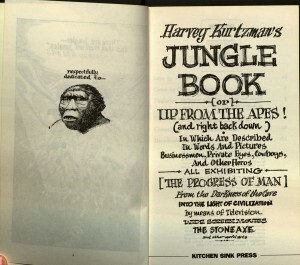 Burroughs continued to publish stories about Tarzan until his death in 1950. Since then, Tarzan has been adopted once again, this time into popular culture. Over 200 movies have been released that feature the Ape Man. Rudyard Kipling’s “The Jungle Book” introduced the character of Mowgli, an inspiration for Burrough’s Tarzan. 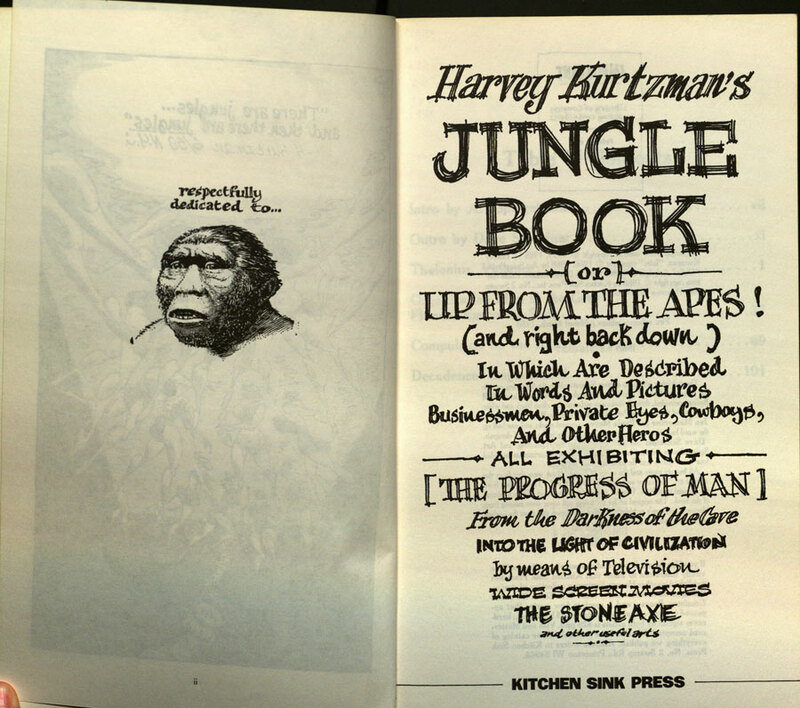 It also inspired this graphic novel by Harvey Kurtzman, also called “The Jungle Book.” Kurtzman’s work is a social commentary on the nature of man in society, and how quickly humanity can descend back into its more primitive forms. Kurtzman satirically dedicates his novel to a half-man, half-ape creature. 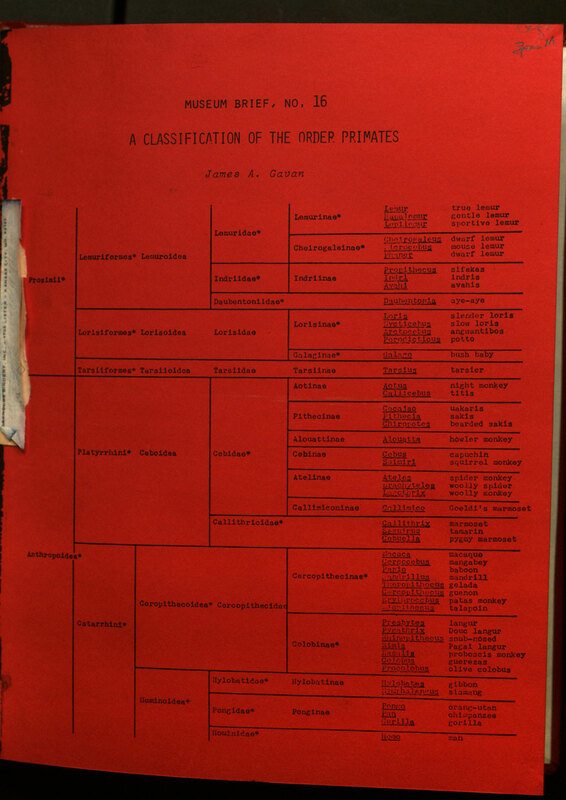 Lastly, and perhaps slightly less aesthetically pleasing, is a chart from former University of Missouri professor James Gavan’s “A Classification of the Order Primates,” which details the line of descent of different species of apes. It’s interesting to note which species Gavan cites as being nearest to man – according to his work, gorillas, orangutans and chimpanzees are just one evolutionary step away from us. Published in 1975, more than a century after Charles Darwin pioneered his Theory of Evolution, Gavan’s work still caused controversies. He participated in a creationism/evolution debate in October, 1975, against a famous creation scientist called Duane Gish, author of several anti-evolution books, including 1972’s “Evidence Against Evolution” and 1986’s “Evolution: The Fossils Say No!” According to audience reaction, Gish outperformed Gavan in the debate. A “rematch” was scheduled, but never occurred. Professor Gavan passed away in 1994, and Gish in 2013. That’s just a small sample of our simian stockpile. Don’t wait for the apes to take over – take a look at these (and other great monkey materials) today!